I was born and grew up in Bombay and I moved to the US a little less than 4 years ago. I have noticed many people here unsure about the correct name for the city. If you are not from India, and are reading this, then you have probably also had that question sometime in your mind: What’s the correct name, is it Mumbai, or is it Bombay? First of all, if you have asked the question above, then pat yourself on the back because not everyone even knows those are two names for the same city. Secondly, don’t blame yourself for not being quite sure what’s the right thing to say because the answer to the question is not so straight forward. It may require a quick dive into the history of the country to understand the context behind it. You might know that India was ruled by the British for 150 years until they finally left in 1947. But that sentence is misleading because India as a country was formed *after* the British left! Before and during the British occupation, there wasn’t as much a country of India as it was a combination of provinces and kingdoms neighboring each other within a geographical area demarcated by water on three sides and the Himalayas on the fourth. There had been periods in its history when most of the regions had come under a common ruler, but for all practical purposes, it was always a fragmented region of loosely connected autonomous territories with different languages and customs. One such region was the state of Bombay. Yes, it used to be the name of a state, with Bombay city as it’s capital (like New York, NY). Though the state covered a very large region that included Gujarati speaking people, the burgeoning city of Bombay was situated within a dominantly Marathi speaking population. In the years after India’s independence, there was an increase in sentiment within the Marathi speaking population to claim it’s own identity around a region that included the city of Bombay. To cut a long story short, after many ups and downs, finally in the year 1960, Bombay state was split into two states: Maharashtra and Gujarat. Bombay city, the former capital of Bombay state, was now the state capital of the newly formed Maharashtra state. And thus began the tension between a cosmopolitan, pluralist, trading city being integrated into a new state formed under linguistic lines. Though the two new states were clearly defined along linguistic lines, it was hard to draw any lines within Bombay city which housed people from all over the country and from all religions and languages. There were tensions among the entitlement felt by Marathi speakers whose state this now was, and that felt by the other local residents of the city who didn’t understand why anything should change for them in the city they have always called home. The world referred to the city as Bombay, the Marathi speakers always referred to it with the colloquial name Mumbai, while Hindi speakers from North India referred to it as Bumbai. As is usually the case in any separatist or self-determination movement, there were political groups on different sides of the movement driven by a divided population. The dominant party in post-independence India was the Congress which had Gandhi and Nehru in its fold. But in the decades leading to the 90s, there was a surge in regional parties that addressed the sentiments of the local populations. The Shiv Sena, with a mainly xenophobic agenda against non-Marathi migrants to the city of Bombay started gaining prominence among the Marathi speaking population. Their name literally means Army of Shiv(aji) and they were known to use violence and force in pushing their ideology. The Marathi population itself was divided in its support for the party. Some could relate to the idea of respect for Marathi culture, but they didn’t find themselves aligned with the use of force and violence. Others were not comfortable with migrants of other communities raking in wealth and power and gaining prominence while they were unable to adapt to the change in this fast growing city. They sympathized with a political party which wielded power on their behalf and painted a picture of a glorious Marathi state and a glorious Marathi city of Mumbai where Marathis get preferential treatment in every sphere. During the infamous communal riots in Bombay in 1992, the chief of the Shiv Sena commandeered his footsmen to kill Muslims in the city and sent a clear message that his party was there to look after the Marathi population and to drive out “foreigners” and “intruders”. On the rise of such a sentiment, coupled with many other political factors, in the year 1995, the Shiv Sena won the State elections and came into power. The first item on their agenda was to officially rename the city from Bombay to Mumbai, a symbolic gesture to claim the city for the Marathi population. There was some rhetoric added on to justify the change – the British left India 50 years ago, why should we still use the name they gave us? But the message was clear: Bombay belongs to the Marathi population and migrants from South India, North India and non-Hindu religions are unwelcome. This was also followed by a mass renaming of public places to honor, Chattrapati Shivaji a historic Marathi king. Victoria Terminus was renamed to Chattrapati Shivaji Terminus. Sahar Airport was renamed to Chattrapati Shivaji Airport. The Prince of Wales museum was renamed to Chttrapati Shivai Museum. All business were required to display their names in English characters and in Marathi. Non-complying business were raided and vandalized. The city was divided in its reaction. Some felt that the city had lost a huge part of it’s heritage, while some found it to be the culmination of decades of the pro-Marathi self-determination movement. There were oppositions and public protests. There were some small victories – the people were able to stop the Shiv Sena from repainting the city transport buses to match the color of their political flag. But the name stayed on. So is it Bombay or Mumbai? However, most English speakers pronounce it as “Moo–m–bye“. This is not how the Shiv Sena wants you to say it. The region of Maharashtra has a great cultural history and has produced some of the best thinkers, saints and philosophers and has highly evolved poetry, prose and the arts. True Maharashtrians are rightfully proud of their heritage while being forward looking and in favor of peaceful evolution of society. They are not stuck on the spelling used to label their city nor are they threatened by an increasingly flattening world. So, you can say what you want, the only people you will offend are the Shiv Sena and it’s hard-line followers who don’t like you anyway. Others, the Bombayites or the Mumbaikars, are more accepting of people from other places, other religions (and other accents) and wouldn’t mind one bit whatever you say. 1534 – Bombay islands were captured by the Portuguese. 1661 – The islands were gifted in the dowry to Charles II of England. 1668 – Charles II gave the islands to the East Indian Company on lease. 1708 – Bombay became the H.Q. of the East India Company. 1862 – The islands were merged to shape one stretch. 1869 – Suez Canal was opened and Bombay developed as an international port. 1947 – Bombay was declared the capital of Bombay state. 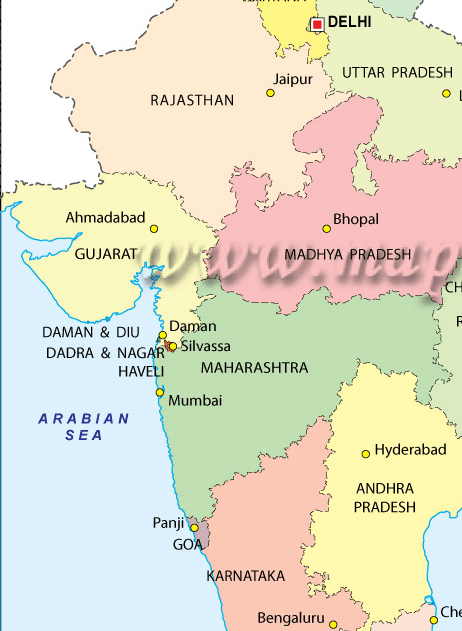 1960 – Bombay was made the capital of Maharashtra. Mumbai is the correct name Sameer,Let me tell you the history behind the name “Mumbai”. The name of the city Bombay (now correctly called Mumbai) is derived from MAA MUMBADEVI . This temple is dedicated to city’s patron Goddess Mumbadevi. The temple of Mumbadevi, once stood on the site of the present Victoria Terminus in the central island which was called Mumbai. The temple was built in honour of Mumbadevi, the patron goddess of the Koli fishermen (Marathi sons of soil) believed to be the original inhabitants of Mumbai. The original temple was built in 1737 was demolished and a new temple erected in its place at Bhuleshwar. The nearest station is Marine Lines.This temple was built in honour of the Goddess Mumbai, from whose name it is said, that the English word ‘Bombay’ is derived. The Mumbadevi temple is six centuries old. The first Mumbadevi temple was situated at Bori Bunder, and is believed to have been destroyed between 1739 and 1770. After the destruction a new temple was erected at the same place at Bhuleshwar. So the bottom line is the name of the city is MUMBAI which corrected now. Better study the matter first then create blogs like this which misguide the readers. dear dinesh where is the archeological proof? do you know there are many Gram devis in bombay only? of which mumba devi is one. @Dinesh : That’s not entirely true, while Mumbai did come from the Mumba Devi temple, the word Bombay comes from the Portuguese word for a good bay. No question of correct or incorrect. Take a local train to Bandra and at the end of your journey, read the name of the station which reads as BANDRA in English, Baandra in Hindi and Vandre in Marathi. These signboards have been put up by the sons of the soil, and no error made by a non-Maharashtrian. Now dear Jagtap, you tell me which is the correct name. I will appreciate an answer from a state loving citizen like you. You may even consult the Shiv Sena or the MNS should you fail to find the correct answer. Actually, the name “Bombay” is derived from the Portuguese “Bom Bahia” which was used as early as 1507. Hence, the name “Bombay” is historically older than the name “Mumbai”. Dinesh is correct. The city is now known as ‘Mumbai’ but people still refer to it as Bombay. If you’re new to Mumbai or visiting the city, I’d suggest you visit this site I found (www.magicalmumbai.com) which tells you in detail about the city. @Sameer – Im not quite sure about Bombay being a state earlier. It was formed by merging 7 islands. dear rohan where is the archeological proof? Dear rohan where is reliable source of information to support your claim. What about Bandra? Marathi name Vandre, Hindi and English name Bandra. There is evidence in all signboards which write Vandre in Marathi and the same in English is written as Bandra. To cite another example, what about the pronunciation of the name of Lord Krishna? Let us see them give an explanation. Please use phonetic symbols. Moombuee can have more than one pronunciations. Whether the place is called Mumbai or Bombay it doesn’t matter. It is the citizens that need to be cared for. Everyone so fixated on History and the correct name. How many people have a strategy to remove the slums and clean up the place? There’s no use deliberating at lengths if there’s no solutions to the problems that already exist in Mumbai. The battle could be amongst linguistic groups but the divide between the rich and the poor is vast. Stop grumbling. I am American. It is Bombay. Mumbai is forced by Hindus onto minorities to oppress them further.